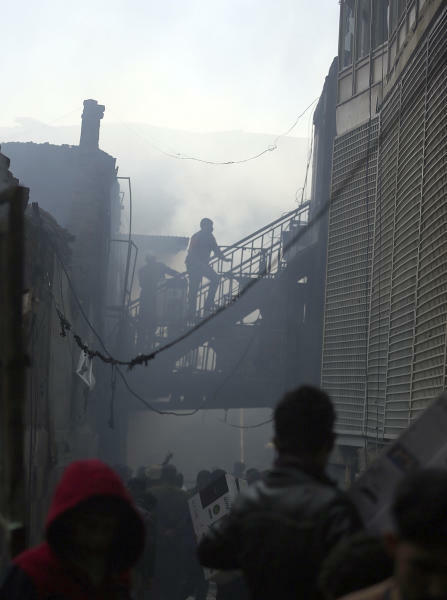 KABUL, Afghanistan (AP) — Residents of the Afghan capital grappled on Friday with the aftermath of a massive fire that destroyed hundreds of stores overnight at a market in central Kabul, incinerating businesses and leaving an apocalyptic scene of disaster in its wake. No casualties were reported but the loss was estimated in the millions of dollars. Firefighters were still struggling, pouring water over smoldering flames in daylight Friday, more than 13 hours after the blaze started at the city's largest market for electronic goods and home appliances. 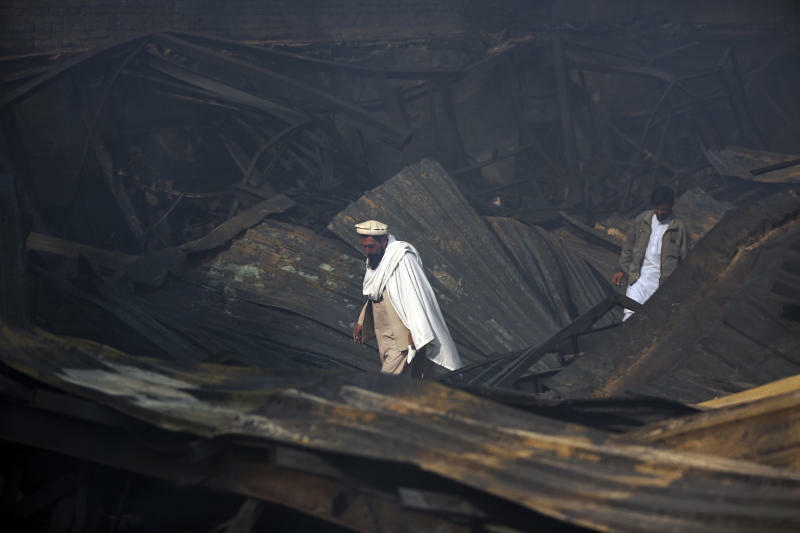 One of the merchants, Hejratullah Khan, sifted through the charred ruins of one of his three mobile phone stores that the fire had destroyed. "There's nothing left .... in one night, everything is gone, everything," Khan as he recounted how it took him 10 years to build up his business. Khan's life savings and those of his two brothers were gone. The three had invested $500,000 into their stores, slowly growing their business even as Afghanistan's violent conflict of 17 years brought increased security concerns. What started as an apparent electrical fire began shortly after 6 p.m. on Thursday, after stores had closed for the night. The blaze roared through shop after shop before firefighters were able to contain it. They struggled with an erratic supply of water, drawn from water lines with very little pressure, as convoys of water trucks were brought in. 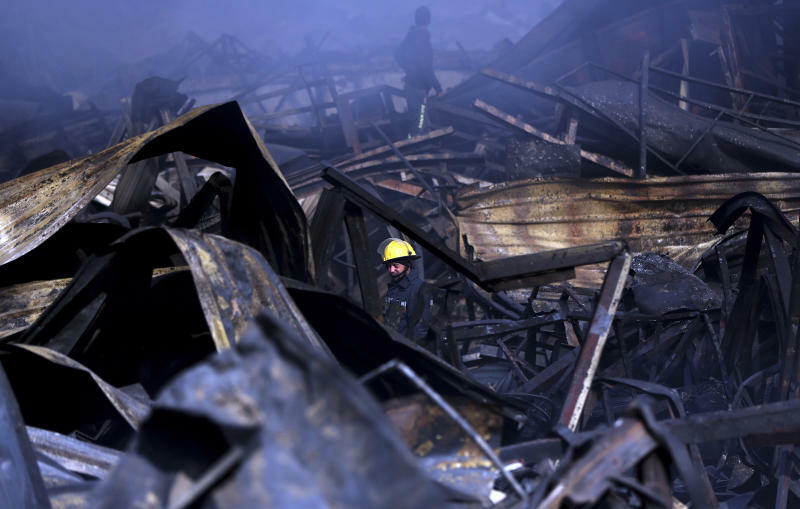 Firefighters were "keeping a close watch and still pouring water on some of the stores," said Zakrullah Zahid, communications officer at the Kabul fire department. Investigators were trying to determine where the fire began as well as what had caused it, he said. Khan said he watched for hours as his stores burned — stores that had fed 30 members of his family, he said. Hundreds of other store owners scrambled to save what they could, some carrying large television sets on their backs, others stacking what they found onto wheelbarrows. Dozens of the storeowners gathered Friday at the scene said they would demand compensation from the government and threatened to block nearby roads on Saturday to press their demands. "Every day in our country people are dying from war and suicide bombers, violence and now this," Khan said, staring at the ruins. Mujibul Rahman said he borrowed tens of thousands of dollars to open his electronics store. The fire consumed $200,000 in inventory. "Now what can I do?" he asked.